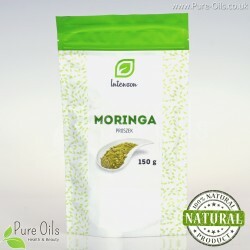 Moringa - powder There is 1 product. Moringa oleifera powder is formed from ground moringa leaves. It is a rich source of wholesome protein and natural fiber. In addition it contains amino acids, polyphenols, antioxidants, vitamins: E, D, A, C and valuable minerals such as: sodium, iron, zinc, magnesium, potassium and calcium.